Kealy’s Coaches in Cullen Co Cork have established themselves as a leader in luxury passenger transport services since their inception back in 1992. Darren Kealy is head of operations at the company and told Irish Trucker what they’re all about. Kealy’s Coaches are embarking on another busy summer period and MD Darren Kealy explained that it’s very much all systems go down in Lislehane, Cullen, Co Cork. Set-up by Darren and his wife Margaret as a sole trader outfit 25 years ago, the decision was taken in 2005 to become a limited company after purchasing O'Sullivans Coaches of Cullen as a part of a business expansion plan. When Irish Trucker caught up with Darren he explained how they’re currently looking forward to what they hope will be another busy summer/autumn stint. “Right now we have six staff working here and around 75 per cent of our work would be contracted to Abbey Tours,”he outlined. 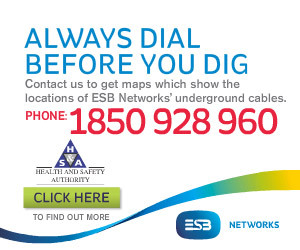 “We do a lot of American and European tourist work in Ireland. The other 25 per cent would be private hire work. The business has grown from a two mini-bus operation to a fleet of executive touring coaches, holding both a national and international operator’s licence. Kealy’s Coaches currently run a modern fleet of eight coaches varying in size from mini coaches 19 to 29 seats and large coaches of 37 to 57 seats. The company’s drivers are experienced professionals who know the highways and byways of Ireland and the business itself has become renowned for its excellence throughout the coaching and touring industry. 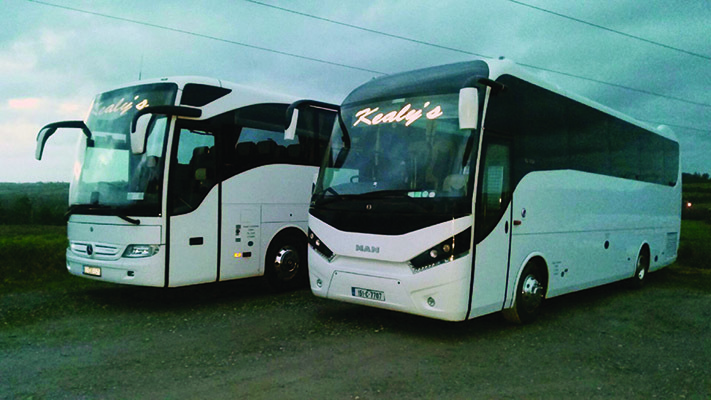 The high standards of service coupled with a modern fleet of vehicles all contribute to one goal, to make Kealy's Coaches the number one choice for tours, travel etc. “Today we have eight vehicles in our fleet and we’ve a modern fleet of coaches that we operate with here. We have a brand new coach coming this month (April) and we’ve bought a number of new coaches in the last few years to make sure that our customers travel in luxury,”said Darren. With a brand new Mercedes –purchased off EvoBus in Coventry –on the way, things are quite looking promising indeed at Kealy’s Coaches and part of the reason for their success is the fact that they are able to provide a luxury coach for all of their customers’travel needs. Whether you are planning a coach tour of Ireland or your local club or social outing, they can cater for your every need. Ask Darren and he’ll tell you that his company’s strength lies in the quality of its vehicles, staff and services, which has continually developed year on year since 1992. The staff at Kealy’s Coaches can deal with any enquiries you may have and can advise on every aspect of your travel plans or put together an all-inclusive package tour, with more comfort, more space and more luxury. Kealy’s Coaches promise to turn the most routine journey into “an adventure”with their first class vehicles and superior service, and being a family run business you can be assured of a personal and courteous service. The company is also a member of Failte Ireland, FOTO (Federation of Transport Operators) and the CTTC (Coach Tourism & Transport Council of Ireland). Catering for corporate travel, airport transfers, day trips, golfing trips, school outings, hen & stag trips, weddings, weekend passenger service, cross-channel trips and pilgrimage trips makes Kealy’s Coaches first choice for so many passengers. As Darren explained, business has experienced a solid upturn in the last few years and, true to form, Kealy’s Coaches are hoping to make hay while the sun shines. “In the last two years there has been a big increase (in business),”he said. “Around 2009/2010 it was tough. Banks weren’t releasing the funds so as companies like us couldn’t buy new coaches and that is always going to make it tough for a business. The success of the company has been built on its policy of satisfaction. When you travel with Kealy’s Coaches you can sit back, relax and enjoy stress free travel as they take the hard work out of organizing your travel arrangements. They can plan and organise an itinerary that will be tailored to your exact requirements and budget and have a coach to suit all requirements. Whether you need a top class touring coach or a standard vehicle the Kealy’s can supply it for you. Whatever coach suits your needs, you can rest assured it is maintained to the highest standards and will be modern, clean and comfortable. The services range from local coach hire in Cork city and county to corporate bookings for companies, clubs and private groups to occasions and guided tours of Ireland. With Kealy’s Coaches your own private coach, supplied with your own driver for tours, transfers, golf trips and lots more. Customers can also hire their own private coach with an experienced driver to go where you please and when you please. There is no limitation to the type of service that Kealy’s Coaches offer and if you have a group large or small, and you need to get to your destination, they are the company to get you there. Now into the second half of 2017, Darren is very optimistic for the year’s remainder. “The hopes look good for the future provided that Brexit doesn’t upset things for us. I’m still hopeful going forward though,”he concluded.